His Holiness the 17th Gyalwang Karmapa, who leads the 900-year-old Karma Kagyu school of Tibetan Buddhism, guiding millions of Buddhists around the world, came to Harvard this past week. 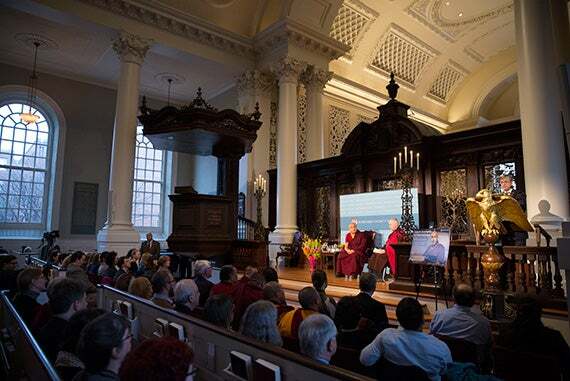 Besides epidemics, wars, violence, and starvation, there is another source of disaster that is often overlooked: “a lack of love.” So said His Holiness the 17th Gyalwang Karmapa, Ogyen Trinley Dorje, to a capacity crowd at Harvard’s Memorial Church during his visit last week. The 29-year-old Karmapa leads the 900-year-old Karma Kagyu school of Tibetan Buddhism, guiding millions of Buddhists around the world. Born to a nomad family in eastern Tibet, the Karmapa was chosen as a child by followers of the previous Karmapa. While in training at the age of 14 he made a dramatic escape from Tibet to India to be near His Holiness the Dalai Lama and his own lineage teachers. The Karmapa said he sees a necessity for religion and centers of learning that educate leaders of all faiths. 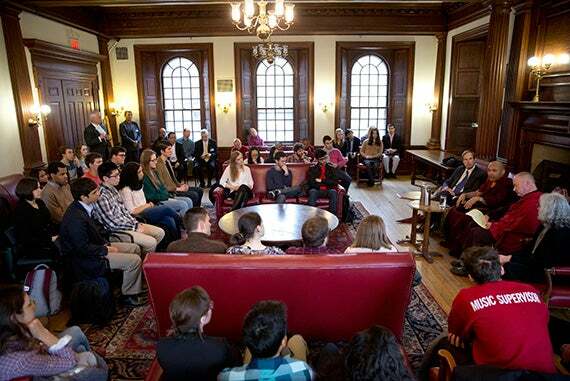 He spoke with faculty and students at Andover Hall at HDS. The Karmapa is considered an environmental activist. He joked about coming to the United States but being unable to sample the American barbecue he's heard so much about because he is a vegetarian. 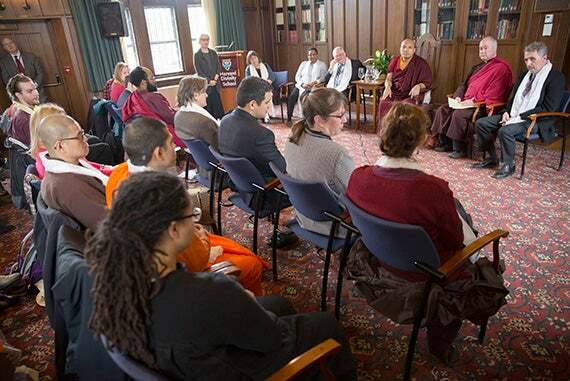 The Karmapa met with undergraduates at Phillips Brooks House. He'd also joined a group of about 15 undergrads for lunch earlier in the day. Dean of Freshmen Thomas A. Dingman (left) sat with the Karmapa during a meeting at Phillips Brooks House. “I do actually speak some English. I feel that I speak it poorly. 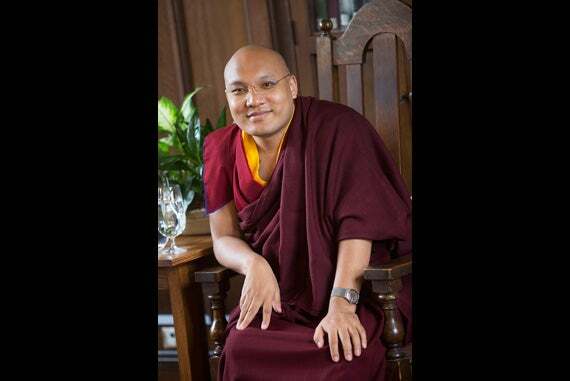 I certainly don't think my English is up to Harvard’s standards,” the Karmapa told an audience the day before. 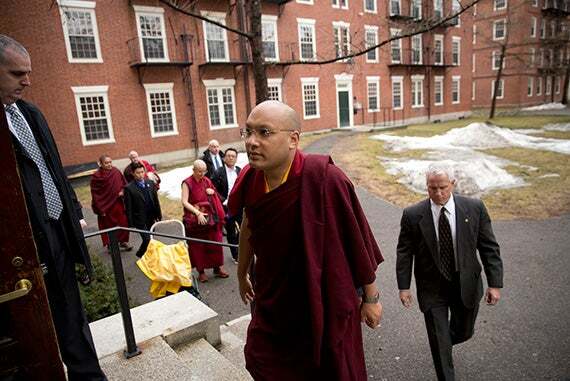 The 17th Gyalwang Karmapa was escorted out of his car by security prior to a walking tour of Harvard Yard. 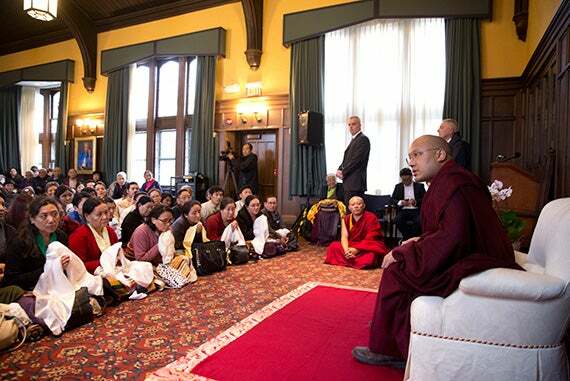 His Holiness the 17th Gyalwang Karmapa spoke with a group from the Boston and Cambridge Tibetan communities inside the Braun Room in Andover Hall. During a talk that was equally entertaining and enlightening, the Karmapa joked about using an interpreter even though he speaks English. “I do actually speak some English. I feel that I speak it poorly. I certainly don’t think my English is up to Harvard’s standards,” he said, evoking laughter from the nearly 1,000 people in attendance at the Thursday talk. He also joked about coming to the United States but being unable to sample the American barbecue he’s heard so much about because he is a vegetarian. 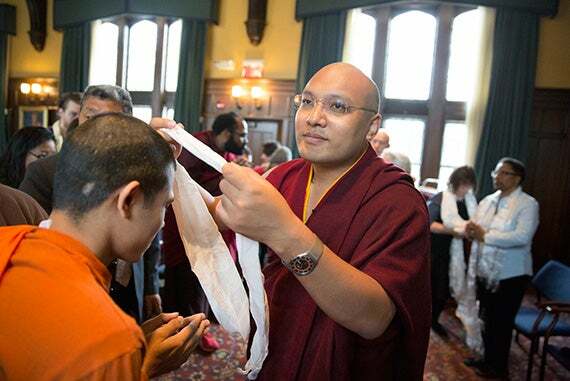 The Karmapa spoke on a range of topics, including Harvard Divinity School’s (HDS) Buddhist Ministry Initiative, his passion and efforts for environmental protection, and the need for religion in the world. The Karmapa is considered an environmental activist. He’s created an eco-monastic movement with more than 55 monasteries across the Himalayas acting as centers of green activism. He sees religious leaders as important teachers and leaders in the environmental protection movement. In addition to environmentalism, the Karmapa is passionate about young people. Much of his stay at Harvard was spent with students at HDS. On the second day of his visit, he had lunch with about 15 freshmen, meeting with a larger group of undergraduates at Phillips Brooks House. Recently, the Karmapa announced plans to establish full ordination for women, a step that will change the future of Tibetan Buddhism. The mention of that effort earned him thunderous applause from those inside the Memorial Church. He said he was very pleased to learn of the recent creation of the Buddhist Ministry Initiative at HDS because of work that will result from it. “Especially because it’s not being approached merely as an objective study, or learning, or scholarship, but something that can actually be brought to bear on global issues, which means that even though it is connected with Buddhist tradition, in a sense it transcends it or grows beyond the boundaries of mere Buddhist tradition,” he said. The Karmapa said he sees a necessity for religion and centers of learning that educate leaders of all faiths, like HDS, because the material and technological progress made by society cannot alone solve all of our problems. “Even worse sometimes, we can lose direction in our lives because of material progress or luxury, and in such circumstances it is especially necessary for us to return to the study of spirituality and cultivate both wisdom and compassion,” he said. The Karmapa’s talk, “Caring for Life on Earth in the 21st Century,” was sponsored by HDS, the Harvard College Freshman Dean’s Office, and the Robert H.N. Ho Family Foundation. His two-day visit to Harvard Divinity School also included blessings for his many Boston-area followers. HDS Dean David N. Hempton presented the Karmapa with a commemorative bowl engraved with the Divinity School’s seal and marked with the date of his visit to Harvard. HDS Associate Dean for Faculty and Academic Affairs Janet Gyatso, the Hershey Professor of Buddhist Studies, helped organize the Karmapa’s visit. 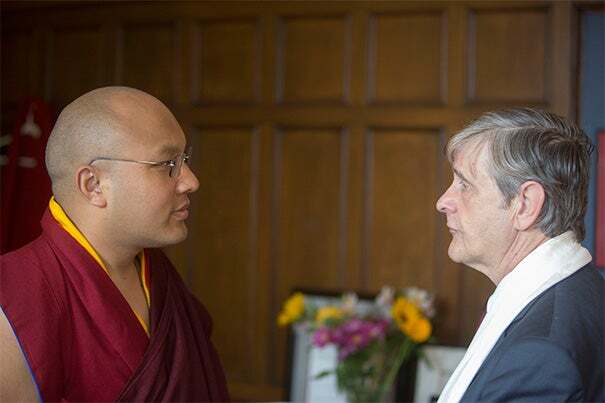 “It is a historic occasion for Harvard Divinity School to welcome this wonderful and visionary young leader of Tibetan Buddhism for the first time. During his visit we talked with him about our programs in Buddhist studies, in the training of ministers and social activists more generally, and [about] a range of interests in what religious ethical insights have to offer the 21st century from across the entire University,” she said. The Karmapa ended his talk at the Memorial Church by urging everyone to feel love. “I urge you to feel a love that is courageous … the joyous acknowledgment of your interdependence with each and every other living being and with this environment itself,” he said. EDUCAUSE President and CEO Diana Oblinger spoke on “The Digital Ecosystem and Higher Education’s Future” as part of the Askwith Forum series at the Harvard Graduate School of Education.